Actor Sushant Singh Rajput has announced his next film titled Rifleman on the occasion of Army Day. The actor posted a video clip on Twitter and revealed he’s playing the titular character in the film, which is being produced by Abundantia Entertainment and Pooja Films. The name of the director and other details about the film have been kept under the wraps. The film, however, is releasing this year itself. 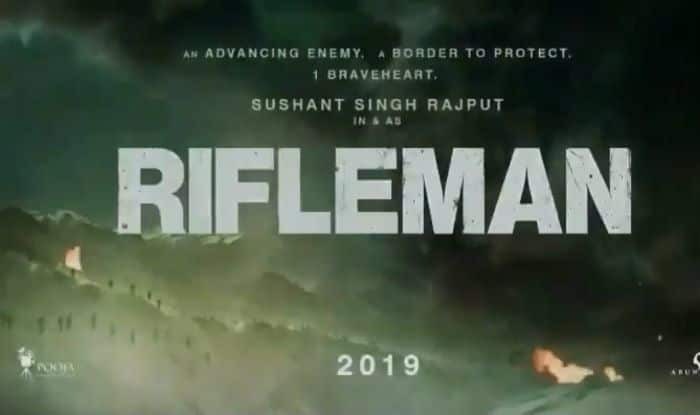 With its first look, Rifleman looks like a film dedicated to the valour of the Indian army. The clip shows fire, mountains and soldiers with the constant noise of blazing guns in the background. Sonchiriya has Sushant performing with actors Manoj Bajpayee, Bhumi Pednekar, Mahesh Balraj, Ranvir Shorey, and Ashutosh Rana among others. The trailer of the film has been appreciated widely. The film is hitting the screens on February 8. In Kizie Aur Manny, the actor will be seen with debutant Sanjana Sanghi as popular casting director Mukesh Chhabra helms the film. Drive is a Dharma Productions film with Jacqueline Fernandes opposite Sushant, directed by Tarun Mansukhani. Chhichhore is being directed by Dangal fame Nitesh Tiwari while Sajid Nadiadwala is producing the film under his home production banner Nadiadwala Grandson Entertainment. Your thoughts on the first look of Rifleman?